Should science fiction follow common scientific understanding of the universe as we know it, whether at the stellar or sub-atomic level? It’s a question facing every science fiction author, and not an easy one, the usual answer being: "Well, sort of…"
A long time ago, when preparing for university, I studied physics, chemistry, mathematics and statistics. I was trying to decide between astrophysics and quantum physics when I fell into psychology, and couldn’t get back out again. I shouldn’t complain, my day job is predicting and preventing large scale accidents, which sounds a little like Hari Seldon’s profession (psychohistory) from Asimov’s Foundation series, the first science fiction I ever read. But sometimes I miss the natural sciences, and I come across snippets of physics from NASA or elsewhere either at the macro level (e.g. the super black hole at the centre of our galaxy) or at the particle level (e.g. Higgs-Boson). So, one day while watching The Big Bang Theory, my current favourite TV series about four nerds, and having had some feedback that my second book didn’t concord exactly with theories of inter-galactic spaces, I decided to brush up on my physics, and bought a paperback copy of a Briefer History of Time, which is a condensed version of the original Brief History of Time. I picked up again near the end on multiple dimensions, and was happy to find that gravity is weaker the more dimensions there are, since I’d just written a chapter set in an 'nth-dimensional space' where all that exists are gases and ‘strings’. Hurrah. The book is a quick read, but not necessarily a quick study. It is enjoyable, though, and I’d recommend it to any science fiction reader or writer who wants a quick look into the last century of related discoveries. Now, back to my original question – does a science fiction reader have to follow current ‘laws’ of physics? The quick answer for me at any rate, is where possible. But the most common violation, particularly in the sub-genre of science fiction known as ‘space opera’, relates to travel and communication over huge distances (many light years) without time dilation effects. Most SF authors find a way around this Einsteinian law, whether via wormholes (aka Einstein-Rosen bridges, because Einstein predicted them a long time before they were found to exist) or a way of ‘warping’ space-time without incurring ‘time-debt’. 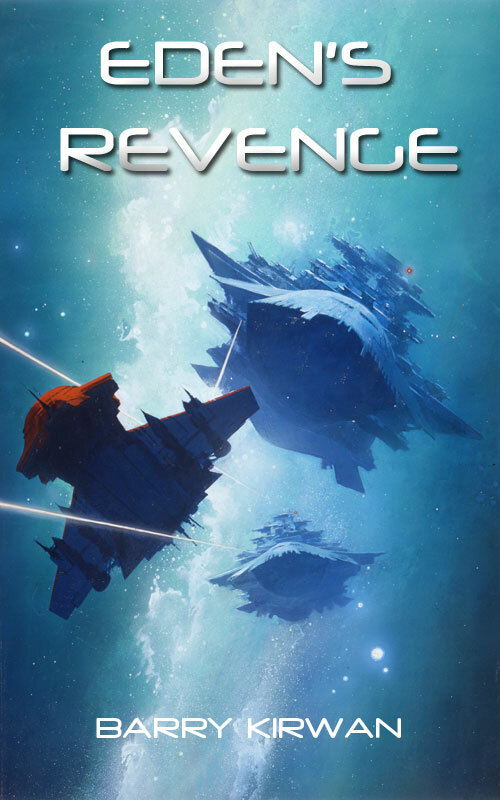 In my own SF series I have people travelling through ‘Transpace’, which I have to say I never fully explain, though in the third book (Eden’s Revenge) it gets a bit more technical, and I even have an alien species (the Shrell) who try to repair damage done to normal space-time by excessive transits through Transpace. Similarly, for communication halfway across the galaxy I use an advanced alien device known as a Hohash, which is an omnipath an can communicate via subspace (subspace is also used in Star Trek, for instance). In defence of SF writers finding workarounds so that space operas aren’t tedious and full of very long journeys and continually losing your entire social network each time you board a faster-than-light cruiser, it has to be said that such ‘laws’ aren’t that stable. In this sense, one thing I really enjoyed about the book was its complete lack of arrogance, admitting that given the Uncertainty Principle, all laws seem to be an approximation, and there may well be future ‘revolutions’ that will reshape our thinking entirely, as scientists from Copernicus and Galileo, to Einstein and Feynman, have shown. The trick is perhaps to have enough science in one’s science fiction to (a) lend it credibility to a more science-knowledgeable audience, and (b) let such readers know that you, the author, are aware you are occasionally treading on thin ice scientifically-speaking. I personally disagree with the so-called ‘mundane’ science fiction movement which states that science fiction should not go against current understanding and scientific plausibility. Two good examples are teleportation and telepathy, which are not currently possible. Should all science fiction ignore these concepts? Because we can’t do it today, does that mean in a thousand years we still won’t be able to do these things? Ten thousand years? And why can't another more advanced alien race do these things, perhaps with different physiology? Teleportation (I haven’t used it yet, by the way) and telepathy (used very sparingly) are fascinating concepts, and in particular telepathy raises all sorts of issues about ourselves and our inter-relationships. Isn’t one of the jobs of science fiction to explore possibilities? In fact, isn’t that the job of modern science and in particular quantum physics? One of the reasons I loved Asimov is that he was also a celebrated physicist. I wish Einstein had written science fiction, it would have been fascinating to see if he would have strayed beyond his own equations for the sake of a good story. A Briefer History of Time by Stephen Hawking and Leonard Mlodinow (who also wrote at least one Star Trek Next Generation Episode). Bantam Press (Random House) 2008 edition. Science fiction should definitely have an edge of realism to it these days. With Google and Wikipedia, the average reader has access to a wealth of information. With scientific thinking infiltrating the main stream, the average reader is better educated than ever- but having said that, part of science fiction's role in society is to push the envelope of our understanding. Furthermore, the more we understand, the more we realize that the universe is a weirder place than any of us ever imagined. Recently I read an article about the discovery of negative-energy gasses whose temperatures drop below absolute zero. A few years ago, if you suggested something like that, you'd be laughed out of the building. The point being, science fiction should never limit itself. Anytime I hear "that's impossible," and the subject is something that doesn't directly contradict a well-tested theory, I laugh because it seems like nowadays "impossible" is just another word for "undiscovered."